It’s December! I’m not entirely sure how that happened, but as you know, a new month means a new #SWDchallenge. Last month, I think I scared some people off when we ventured outside of data visualization land with a sticky note focused exercise (challenge | recap post). I remain a strong believer in this sort of low tech planning, so don’t be surprised if we revisit something similar in the future. But this month, we’re back to graphs with an open-ended holiday challenge. ‘Tis the season to be merry (irrespective of which holiday you celebrate), so let’s combine that festive cheer with something near and dear to us all: data visualization! 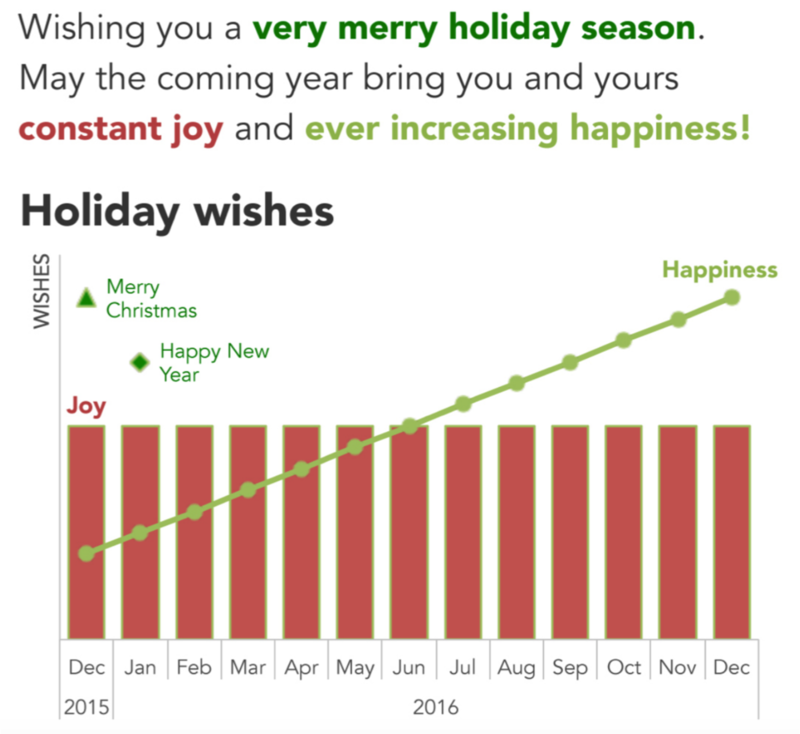 This month, your challenge is to visualize data related to the holidays. I welcome you to create anything you’d like that combines data and holiday (and any holiday is fine, though given the timing I’m guessing we’ll see a lot of winter-related ones!). Data exists (or could be compiled) on all sorts of holiday-related things: where various Thanksgiving food items come from, the cost of Christmas, whether certain holidays were historically snowy in your city of interest, or popular holiday music, for example. I’ve started a list here, but it is definitely incomplete—if you encounter any amazing sources of holiday-related data, or create any that you’d like to share please add them! DEADLINE: Monday December 10th by midnight PST. Full submission details follow—be sure to email it to us, taking note of specifics below, for inclusion in recap post! You're also welcome to share at any point on social media using #SWDchallenge. Make it. Identify your data and create your visual with your tool of choice. If you need help finding data, check out this list of publicly available data sources or here’s a special one focused on the holidays for this month’s challenge. You're also welcome to use a real work example if you'd like, just please don't share anything confidential. Share it. Email your entry to SWDchallenge@storytellingwithdata.com by the deadline. Attach your image as a .PNG. Put any commentary you’d like included in the follow up post in the body of the email (e.g. what tool you used, any notes on your methods or thought process you’d like to share); if there’s a social media profile or blog/site you’d like mentioned, please embed the links directly in your commentary (e.g. Blog | Twitter). If you’re going to write more than a paragraph or so, I encourage you to post it externally and provide a link or summary for inclusion. Feel free to also share on social media at any point using #SWDchallenge. We look forward to seeing what you come up with! Stay tuned for a cheery recap post sharing back the submissions received later this month. In the meantime, check out the #SWDchallenge page for past challenge details and recaps.